Contributed by Tatsuya Seto, Japanese student at ILSC-Sydney. 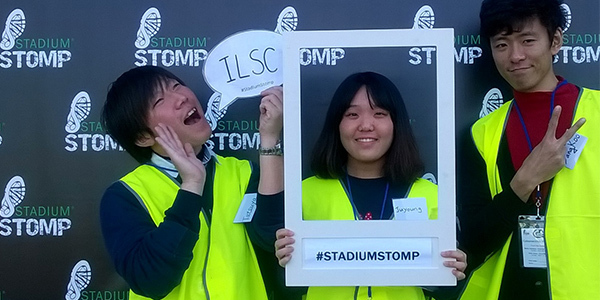 Tatsuya Seto (left) volunteering at Stadium Stomp in Sydney. I want to work for a company which has an opportunity to use English. So I have to study English in English-speaking country. When I looked for a language school, I found ILSC Sydney. I knew that at ILSC Sydney there are many kinds of class and activities. I thought I could not only study English but have other experiences, so I decided to come to Sydney. I was so surprised that the culture in Australia was totally different from Japanese culture. All students of ILSC Sydney were very active so I was amazed. I made friends from Korea, Brazil, Colombia, Switzerland etc. They were amazing people and they studied hard and they were very positive about school activities. I participated in many kinds of activities, for example watching movies at the school, walking around Sydney and watching rugby with my friends. I also joined volunteer activities. Through these activities, I was able to learn expressions which I haven’t learnt in class. In the activity, we had an opportunity to speak native speakers, I had a great time with them. I joined Stadium Stomp, annual sports event in Sydney, as a volunteer staff. I directed participants to the next point and encouraged them. In this event, I was able to get new Australian friend! I think that we should participate in school activities as much as we can. Because joining the activities, we can make many friends and get great opportunity that we can experience only in Australia. If we don’t join a volunteer activity, we spend a great time only in home and school. Through the volunteering, we can understand that we are a citizen in Australia, and we can get chance to speak English more and more.